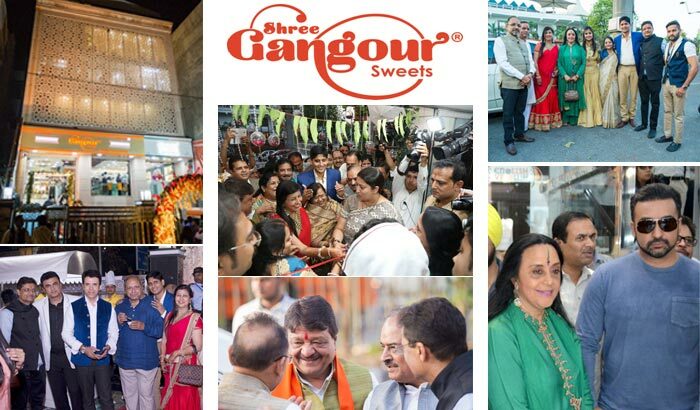 Shree Gangour Sweets comes to Delhi to sweeten our lives! Shree Gangour Sweets is now in Delhi to make our lives sweeter and aromatic. With a view to strengthening its presence in New Delhi, Gangour Sweets is setting up its first shop in the capital city. The Mumbai based restaurant chain is known for its sweets and top quality food and services and has successfully expanded its presence in Mumbai, Indore, Goa and Dubai. Shree Gangour Sweets in Nirman Vihar, Vikas Marg was inaugurated by the Union Textiles Minister, Smriti Irani. Present at the occasion were celebrities like Ila Arun (Bollywood Singer), Raj Kundra, renowned Business man and Shilpa Shetty’s husband, Kailash Vijaywargiya, BJP’S General Secretary and Local renowned Politicians like Om Prakash Sharma and Gurcharan Singh Raju, eminent TV personalities like Sudhir Pandey, Bobby Khanna, Sooraj Thapar. Other well-known personalities of the society were also a part of the launch, making the event an even grander one. The 1450 sq. ft. outlet has an architectural and traditional interior with five floors packed with sweet shop, restaurant, banquet hall and a roof top banquet for social gatherings. A variety of 150 kinds of exclusive sweets will be in offer besides a wide range of lip smacking food and mouth watering food items, all served in a completely relaxed environment. The signature restaurant at the outlet will also offer molecular dishes served in a visually appealing style to the guests. Shree Gangour Groups’ Delhi outlet will be the ultimate destination for pure food and its array of exclusive offerings. Moreover an inviting fancy decor, soothing lights and food visuals coupled with superior customer services and innovative food display promises to create a complete sensory experience which will ensure an experiential, solutions oriented and most pleasurable shopping and dine-in experience. English Vinglish, a dessert boutique by Master Chef Ranveer Brar, serves the most of incredible combinations to maintain a creative equilibrium along with its exceptional products at Gangour Sweets. Being Indian, sweets are a holistic part our lives and English Vinglish, pampers that perennial love for sweets. Shree Gangour’s sui generis sweets and innovative quotient of its Chefs yields products like Sweet Potato, Gulab Jamun, Cheese cake. The Baked VadaPav is a cut on calories, which is baked within a whole-wheat bun for all the VadaPav fanatics. Motichoor Parfait is again a renowned France dessert altered with vibrant Indian colors accompanying the timeless Motichoor Bundi and PistaKatli. English Vinglish also offers a huge spectrum of bakery products like health abiding breads, scrumptious unique cookies of varied flavors (masala chai, kalakand, etc), multihued macaroons, regal baklavas and so much more. Shree Gangour Sweets has already been a popular name and has been catering to a large number of customers from Mumbai, Indore, Goa and Dubai. Share the post "Shree Gangour Sweets comes to Delhi to sweeten our lives!" Experience a Different ‘World’ of Food at ECHOES!